TV advertising is in rude health, with more than £5bn to spread around, up more than 7% on 2014. So it’s no mystery why UKTV decided to move its pay channel Home to the ad-supported, free-to-air Freeview platform. UKTV now has more ad-supported channels than pay ones and it is not alone in making this kind of ad-friendly switch. ITV’s advertising income has grown in recent times, despite falling aggregate audiences. So why, if the ad market is so buoyant, are TV broadcasters worried about how to tackle programmatic sales, the new type of ad trading pioneered by the likes of Google and Facebook? The short answer: TV is changing. While there is still £5.3bn in TV ad money in the UK (according to Thinkbox, the broadcast trade body), there are fundamental and irreversible shifts in how TV is being consumed. According to eMarketer, UK consumers’ overall viewing increased from four hours a day in 2011 to six in 2015. Growth in viewing on mobile devices accounted for most of this rise, and advertisers are keen to deliver their messages to consumers on these devices. The research company reckons that by the end of this year, about £1bn of the UK’s £5bn TV ad spend could come from catch-up or on-demand video – a near doubling of the ad money VoD attracted last year. 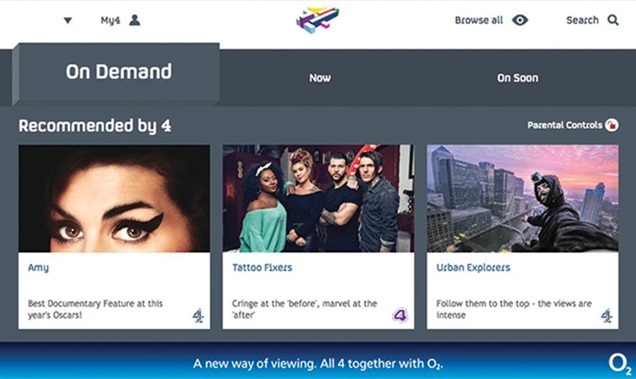 Sky has pioneered a programmatic approach to selling some ad inventory, using data from its set-top boxes and third-party sources to create more targeted advertising opportunities. Sky Media deputy managing director Jamie West says it has found 32% less channel switching when there are targeted ads in the breaks. Channel 4 says a programmatic campaign on All 4 (pictured) is on average 72% more efficient and delivers 24% more ad recognition. C4 believes programmatic sales will double to around 30% of total video advertising by the end of 2016. ITV will be in a position to offer targeted advertising in around 50% of its ITV Hub inventory by the summer. This is an inflection point. Broadcasters rightly worry that putting such technology into their trading will lessen their control over what ads each viewer sees. Advertisers are guaranteed audiences and the broadcaster must deliver them or risk paying back money. Advertising technology companies FreeWheel and Videology are growing fast. Their idea is to add “data-driven optimisation” to the TV ad sale – all the good stuff from online, but with the broadcaster keeping control so up-front deals remain in place. Such deals are the foundation of the TV business because they fund commissioning and programme acquisitions. Broadcasters are moving on from dipping their toe into the programmatic waters; they’re making it the solution for all their on-demand and linear inventory. Videology predicts that by 2020, a whopping 70% of all linear TV ad inventory will be sold programmatically. The holdouts will be big peak-time programme slots, live shows like The X Factor and sport.